In 2014, more than 99 percent of Red Lake County had access to broadband. (Broadband was defined with lower speeds back then.) Today more than 99 percent of the county has access to broadband speeds of 25/3 (Mbps down/up) and 48 percent have access to the 2026 speed goals of 100/20. Red Lake has been a leader in broadband for many years. They are always one of the top covered counties but it looks like they may need to think about broadband if they want to keep that standing at the 2026 speed goals. 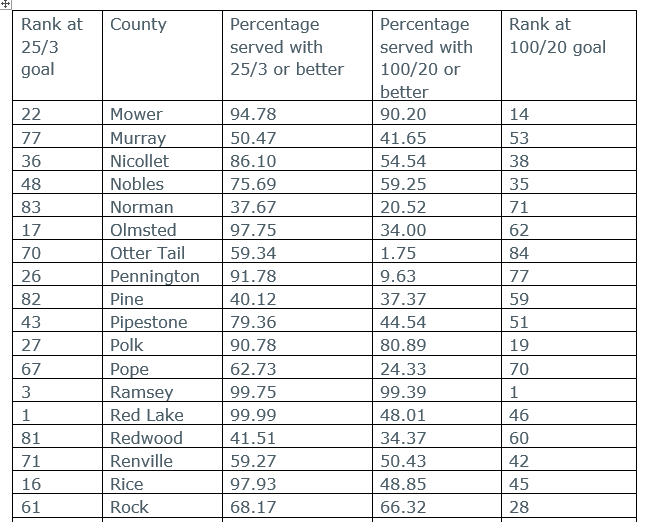 The good news is that Red Lake County is served by Garden Valley Telephone, Halsted and Sjoberg’s – all engaged providers. Garden Valley already has some fiber in the area; one hope is that that extend their services and/or that the others upgrade their networks. DDI score of 34.48 out of 100.